Frederiction, NB: Goose Lane, c2013. This read was something I hadn't really considered picking up when I first heard of it, but I had a copy handy so started browsing it. Then I quickly found myself turning to page 1 and reading without ceasing. It's a combination of memoir/social commentary on illness and the experience of chronic patients in the Canadian health care system. And it is powerful. Devaney relates how she was seriously ill for a long time until finally being diagnosed with colitis. She reveals the condescension and attitude she experienced as a young woman who dared to challenge the opinions of doctors and nurses, and the way that her own experience of pain was ignored or minimized by the "system". During all of the initial flare ups of her illness, she was also a grad student and a social activist. Through her story she also shares the ways in which academia dismissed her illness as laziness, a stress response, or simply attention seeking. There were no accommodations made to allow for her physical limitations, despite the fact that her academic work was still excellent. But rather than simply complaining, Devaney decided to do something about it. She created a play and a workshop to sensitize health workers to the needs of patients, to really personalize the individual who is being treated. She's written this book to bring the lived experience of chronic, serious illness and its accompanying pain to a wider audience. I think she's been successful at sharing the facts of illness and how it shapes a life, a lesson that many of us have not had to suffer through. 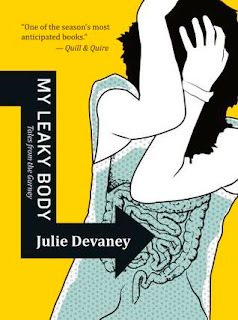 This book is very well-written, with humour and pathos and extremely open and graphic descriptions of her "leaky body". Not for the squeamish... She is sharing a critical time in her very full life, as a student, as a wife, a daughter, an activist, and a patient. Remembering that patients are more than just patients is a key message -- they are people with a full life of concerns and relationships which also affect their experience of illness and healing. Anyone who is interested or involved in health care must read this. For me, it was reading out of my usual purview but was eye-opening and compelling. I think people are too often judgmental, especially of women's health concerns or challenges, instead of empathetic. This book does sound eye-opening. Wonderful review of this memoir! Very true! I think this book does a really great job of explaining what chronic illness actually feels like. Thank you so much for this review! I really hope my library has a copy because it sounds as though it was written just for me :) I was diagnosed with ulcerative colitis in 2008 and I've never seen anything that sounds even remotely this similar to my experiences. Many thanks, Melwyk! Oh, would love to hear your opinion as someone who knows, if you do find this! Glad I could share it. Read this review and put the book on hold the same day. Picked it up at the library the next evening and had it finished within 24 hours! How's that for fast turn-around! This book basically told my story. Well, except that she had a lousy experience with a naturopath and my naturopath has been the reason I've stayed sane - and the reason I've avoided surgery so far, which is the biggest difference in our stories. I've read a lot of books about ulcerative colitis, even stories written by patients, and nothing has captured the real sense of living with a chronic illness quite like she does. Thank you so much for reviewing this book and bringing it to my attention. I'm going to try to write a review soon for my blog. Look forward to your review -- so happy that you found this book and thought it was spot on! First, this is a fine blog. Then your review is of interest to me just now suffering from the medical establishment during my husband's terminal cancer. I'm so very sorry for your loss. I can't imagine having to deal with bureaucracy during such a time as well.